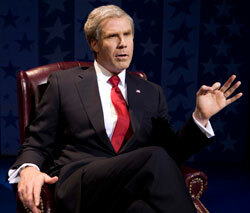 Will Ferrell has never struck me as the funniest man alive, but his performance in You’re Welcome America: A Final Night with George W. Bush is a consistent and yes, funny portrait of our 43rd president. The piece overall is a little like an over-extended “Saturday Night Live” skit. It's a tongue-in-cheek look at the presidency of George W. Bush and what his private thoughts might have revealed were we so privileged to get inside his head. When you enter the theatre you are greeted by a set that could be a campaign stop, bunting on the proscenium and lots of red, white and blue. There is a post-and-rail fence segment down right with a piece of tumbleweed lying against it. Considering the amount of time President Bush spent on vacation and in Crawford, Texas during his tenure, it only seems appropriate that the show would chronicle this. There is a secret service agent at the edge of the stage with his hands folded in front of him as he scans the crowd for would-be security risks. The play starts with Ferrell being dropped from the fly space on the end of a tether from a helicopter wearing a flight-suit and helmet. This was obviously done for theatrical affect but was meant to be reminiscent of his arrival on the USS Abraham Lincoln to trumpet his mission accomplished heralding the “successful“ end of ground operations in Iraq.Ferrell’s Bush is every bit the caricature of the dolt that late-night comedians made him out to be (with plenty of help from Bush). Also written by Ferrell, the piece is modestly funny. Given the current state of our country, perhaps the wounds are too fresh to completely enjoy You’re Welcome America. Eight years of Bush’s malaprops have left the country with a longing for someone who can complete a sentence without looking the fool. But that begs the question would the show be funny if the producers waited? The cast is rounded out with ancillary minor characters including a shoe-throwing audience member, a secret service agent and Condoleezza Rice with whom Ferrell does a naughty pas de deux of dirty dancing. The secret service agent is one of the severely regrettable aspects of this piece. In a cheap convention the director uses the secret service agent as an oaf to cover Ferrell’s costume changes by having the agent break into break-dance segments that get more and more elaborate with each “in-one” he does until he finally gets caught by President Bush. Don’t worry if you can’t get tickets to the show. It’s only scheduled to run through March 15 but will be aired live on HBO on March 14, the night before the scheduled closing performance. The show has broken the house record at the Cort Theatre by taking in $846,507.05 for the week that ended on Feb. 15. You're Welcome America: A Final Night with George W. Bush is written by and starring Will Ferrell with Michael Delaney, Patrick Ferrell, Pia Glenn and Adam Mucci. Directed by: Adam McKay. It stars Will FerrellIt runs through March 15, 2009 at the Cort Theatre. More information/buy tickets.